Well, I started using essential oils as my facial moisturizer for a couple of days (since 1 June) now, and I love it especially the richness of pure fragrances! The qualified aroma therapist, who purchased ALL her essential oils in UK only, made a prescriptive blend of pure essential oils mixed in carrier oil for my skin's specific needs. 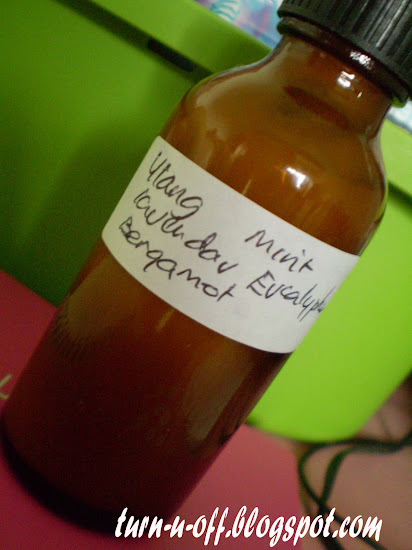 Custom-formulated blend of Eucalyptus, Bergamot, Mint, Ylang-Ylang and Lavender (It costs about RM97). I love the different aromas on my face! I know, as in all natural remedies, there are no magic wands and it may take time for me to see visible results but I'll let you know how things turn out. So, do you have any experience using essential oils? or something to share? Hi Monica, I use Lux soap, or Palmolive, ha ha. But, you already have a nice complexion...? Have a nice weekend, Monica, Lee. Basically, a aromatherapist will mix a few drops of essential oils in a carrier oil to suit the need of the person. Bergamot and Lavender are very good for oily skin. Ylang-Ylang helps to control the production of sebum, smooths the skin and stimulates new cell growth. Eucalyptus can calm skin eruptions and clear congested skin. Yes, the price is quite reasonable coz the aromatherapist (who's also my friend) has to fly to UK all the time and get the essential oils. so I need this to help regulate moisture levels on my skin and I think even beautiful-looking skin always has some bothersome aspect too. I think I'm the worst person when it comes to taking care of my face. I hardly use anything on my face except for makeup and the occasional moisturizer. I gotta take tips from you monica! hehe..